Are you eligible to enroll in Medicare Part D or switch to a new plan? If you aren’t sure, SilverScript® Insurance Company can help. For example, you qualify for Medicare Part D prescription drug coverage when you turn 65 or have a disability. You can also enroll in or switch your Medicare Part D plan if you’re moving, because Medicare prescription drug plans can differ by location. These are just some of the Medicare Part D eligibility requirements. Another option is to enroll in or switch your plan during the Annual Election Period (AEP), which begins October 15 and ends December 7. 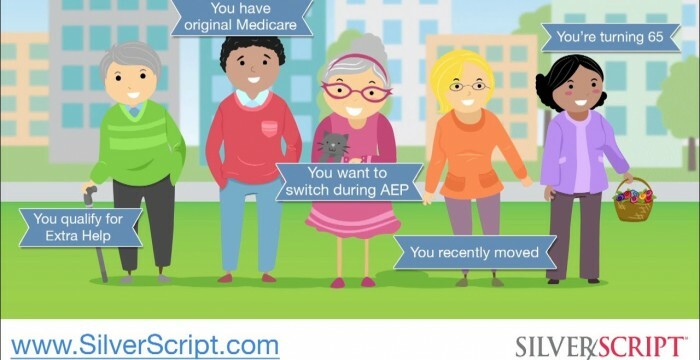 This video covers some questions your may have about enrolling in a Medicare Part D prescription drug plan. . Watch the video to find out when to enroll in a SilverScript prescription drug plan (PDP), and visit our website to see all of the eligibility requirements. This information is available for free in other languages. Please call our Customer Care number at 1-855-675-3287 (TTY: 1-866-552-6288), 24 hours a day, 7 days a week. Esta información está disponible gratuitamente en otros idiomas. Llame a nuestro Servicio al Miembro, al 1-855-675-3287 (teléfono de texto (TTY): 1-866-552-6288), las 24 horas del día, los 7 días de la semana. This entry was posted in medicare supplement and tagged Health Care (Industry), medicare (brand), medicare part d, Prescription Drug (Drug Legal Status), SilverScript. Bookmark the permalink.